Slow DNS servers can make for a terrible web browsing experience, but knowing which one to use isn't easy. 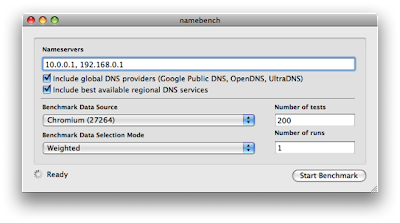 namebench is a new open source tool that helps to take the guess-work out of the DNS server selection process. namebench benchmarks available DNS services and provides a personalized comparison to show you which name servers perform the best. 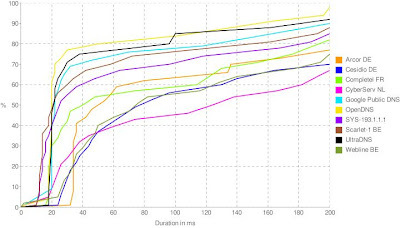 As a System Administrator at Google, I was curious about measuring how BGP route selection affected the performance of Google Public DNS. This curiosity resulted in writing a small benchmarking script, which was further developed during my 20% time to become a full-featured application for Windows, Linux, and Mac OS X. In order to provide the most relevant results, namebench employs a number of interesting techniques. First, it personalizes the benchmark by making use of your browser history to see what hosts to benchmark with. It also determines cache-sharing relationships between different IP's and removes the slowest of these servers to avoid improperly benchmarking them solely on cached results. namebench will also report on DNS misbehavior such as DNS hijacking and censorship. namebench 1.0 is available for download now. If you would like to discuss or have any questions namebench, please join the namebench mailing list. Happy hacking!